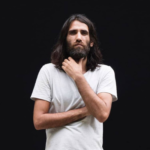 Behrouz Boochani is a Kurdish journalist, writer, poet and filmmaker. He has been held in Manus Island detention centre since 2013. During his time in detention he has published regularly with The Guardian, and his writing also features in The Saturday Paper, Huffington Post, New Matilda, The Financial Times and The Sydney Morning Heraldcoveringthe plight of his fellow refugees, held by the Australian government on Manus Island. In 2018 he published his novel — No Friend But the Mountains: Writing from Manus Prison, which won Australia’s most valuable literary award, the $100,000 2019 Victorian Prize for Literature. His journalism has also been awarded the Amnesty International Australia 2017 Media Award, the Diaspora Symposium Social Justice Award, the Liberty Victoria 2018 Empty Chair Award, and the Anna Politkovskaya Award for journalism. Boochani remains in detention in Manus Island.